Does it matter whether you ‘Safely Remove' devices, as Windows requests? Yes. If you pop a memory card out of its reader or pull an external drive out of its USB port while Windows is reading or writing data, you could end up with corrupted files, unreadable media, or both. The problem is, it's not always easy to tell when Windows or an application is reading or writing data. In fact, all may seem quiet on the read/write front, but a program might be doing something behind the scenes. That's why it's essential to use the Safely Remove Hardware option--hidden and slightly confusing though it may be. The icon resides in the system tray, which you may have to expand by clicking the arrow. Click the icon, and you'll see a pop-up menu listing the devices that can be ‘safely removed'. Click the one that corresponds to your memory card, flash drive, or whatever, and wait until you see the ‘Safe to Remove Hardware' message. Only then can you unplug. If you don't see a Safely Remove Hardware icon in your system tray, or if you're not quite sure which listing corresponds to your card or drive, you have another option. 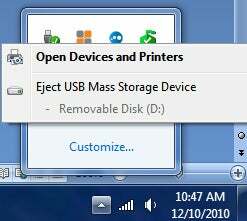 Double-click Computer (or My Computer) to open it, and find the icon for the device. Right-click it, and choose Eject.